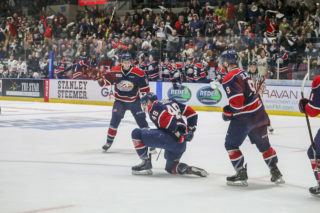 A chapter of Windsor Spitfires hockey has come to a close. In addition to backstopping the club to its third-ever Memorial Cup title in 2017, Amherstburg, Ont. native Michael DiPietro departs as a franchise record-holder in career wins (86), shutouts (16), goals-against average (2.52), save percentage (.914) and games played (157). A third round pick of the Vancouver Canucks in 2017, DiPietro also set single-season franchise records for goals-against average (2.35, 2016-17), save percentage (.917, 2016-17) and shutouts (7, 2017-18) while also becoming the first Spitfires netminder to ever claim OHL Goaltender of the Year honours (2017-18). TRADE NEWS: @miketendy has been traded to the Ottawa 67s. He joins the Eastern Conference-leading Ottawa 67’s who currently hold an OHL-best 22-3-3-1 record. 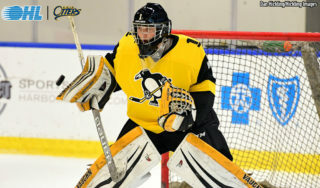 “I’m a Spitfire and I always will be no matter where I go,” DiPietro told reporters during a Tuesday afternoon press conference. “Growing up and watching the Spitfires and having the honour to play for them and win the Memorial Cup. I look back and there are so many memories. “I was very blessed to have the opportunity to impact as many people as I did,” he added, citing his numerous off-ice connections with fans and kids in the community. 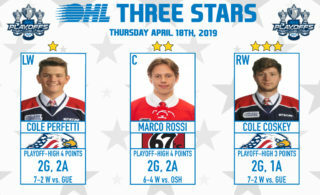 After being a second round pick of the Spits from the Sun County Panthers Minor Midgets in 2015, DiPietro earned the FW Dinty Moore Trophy for the league’s lowest rookie goals-against average (2.45) while also being named as a member of the OHL’s First All-Rookie Team. 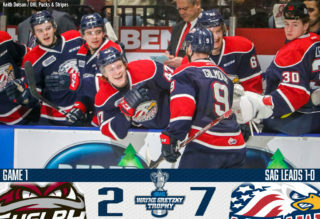 In addition to his OHL success, DiPietro represented Canada at the 2015 World Under-17 Hockey Challenge, the 2016 IIHF World Under-18 Hockey Championship, the 2017 Ivan Hlinka Memorial Tournament and most recently, the 2018 IIHF World Hockey Championship alongside several NHL players. 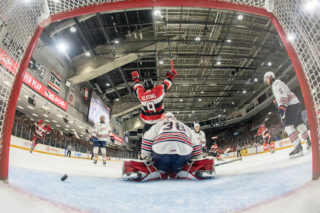 He’s represented the OHL twice in the CIBC Canada Russia Series and suited up as a member of Team Orr at the 2017 Sherwin-Williams CHL/NHL Top Prospects Game in Quebec City. 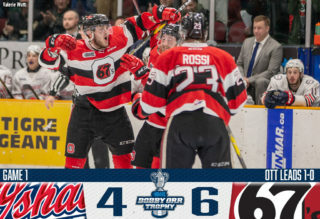 DiPietro joins the 67’s, who will be in action on Friday in Gatineau as they take on the QMJHL’s Olympiques in a special interleague battle.